How to lose belly fat-ULTIMATE FAT LOSS GUIDE! I have been getting a lot of questions lately about how to lose belly fat, how to drop the weight and break free from the never ending cycle of being on and off diets, on and off gym classes, while the only thing that seems to stay consistent is the weight on the scale. If you are ready, then I am ready. I will show you how to lose fat, no matter what body-fat percentage you are at right now and ultimately uncover your abs and train them the right way. You will have a solid plan for long term success and results. It won’t be a short journey (no shortcuts here), I can tell you. But I am sure that if you are willing to put in the effort, you will be rewarded. period. Now, for you to start this journey successfully, you will need to keep in mind that your main goal is to reduce body fat, not your overall body weight. When you just focus on reducing your bodyweight, you will easily neglect things like: your overall health, strength, and muscle mass. You can literally lose just muscle and water (and keep all the fat) and you will see the number on the scale will go down. Obviously, you will end up with a “skinny fat” look and won’t feel too great either. The number on the scale does not reflect anything about you, or your health. If you look at athletes, such as bodybuilders, they weigh a lot. Their body fat percentage is very low for you to see that great muscle definition. In fact, they are at their lowest when they are competing and they still weigh a lot. So to say that they are obese because they weigh a lot is absurd. Now that we got that straightened up. I will get started with this guide. I will break it down for you intro categories, so that no matter which category you are at right now, it is easy for you to get started and move down to the next category. If you have a higher than average fat percentage. Your next goal is to get to the next range. Do not focus on dropping hundreds of pounds. If you emphasize on the latter, you will get overwhelmed. When you have a very high-fat percentage, your main focus is to bring awareness to the foods you consume everyday. What has led you to where you are (good or bad), are your daily eating habits. Try to get a food journal and write down what you eat, and how much you are eating of it. Are you drinking a lot of soda or deep fried foods? How many days are you eating out on an average week? do you consume the typical office snacks like donuts, pizzas, and muffins? Your food journal is your way of monitoring yourself. If you are completely lost to even recognize if those foods are not what you should be eating. I seriously encourage you to share your food journal with me by emailing me or just commenting below this post. I will be happy to help you in any way. However, it can be super easy to want to do it all at this stage. Focusing on monitoring and not trying to change it all. These are just few examples to help you out! You can write down these 5 breakfasts and rotate between them throughout the week. Next, you can start drinking more water. So make sure you always have a water bottle available to you anywhere you go. The step after that would be to take your lunch to work twice a day. Again plan couple healthy recipes and rotate between them. Nothing too crazy but you get the idea; small incremental changes. You master one, then move to the next. I have to emphasize this again: If you start this process trying to do everything, you will end up doing nothing. People fail because of that overwhelming thought of having to change their life upside down to lose weight. the result? nothing changes. So your main goal here is to reduce overwhelm and start with small steps, until they become a habit (as brushing your teeth) and move on to the next step. I assure you that few weeks in, you will feel like a total different person. If you have been sedentary for years, then it is time for you to engage in daily activities like walking for 30 minutes to the grocery store. If you join a gym or have some space where you can workout at home, start with that. Introduce yourself to interval training; whatever it is the activity you do, follow this technique: increase the intensity for 30-50 seconds, and decrease your intensity for 10-20 seconds. If you are walking then just walk fast during the first interval and then walk slow during the next. It is important to do this process because interval training is one of the best ways to burn fat fast. If you like to use cardio machines at the gym, you want to use the interval example likewise. The thing is, you have work to do to uncover layers of fat to actually see any muscle definition. I would never advise any person in this category to do crunches and isolation exercises because they are not likely to see any results, which may only overwhelm them even more. At this point, your nutrition is still the most important part to focus on. You already have made a few changes, you feel confident you can get results, and you are ready to go to the next step. Meal planning is something to introduce yourself to and work on at this point. If you have been taking your meals twice a week to work, now you want to be planning more meals, and try to cook at home more often. Check out this meal planning guide here for more information on how to do that. Supplementation can be introduced at this point. Since you probably will be working out more often it would be beneficial to supplement with a protein powder, minerals and things that will support your recovery process. Although this is not necessary, it is up to you and how your body feels. Interval workouts will always be part of your routine. If you haven’t already, introduce yourself to strength training basics – you want to be doing a lot of core work here. You don’t want to rush into heavy lifting as there is a risk to injure yourself if you are not ready for demanding exercises if you haven’t mastered the basics first. Although you can experiment with light weights and just get yourself used to them. Following this plan, will get you down to the next category. This is a typical range of a fit body. Getting here is a great accomplishment, especially if you have started from the top. you are now a master of your nutrition and training. It takes a lot of dedication, consistency, and determination to take your body from a very high body fat to this range. For individuals who are natural ectomorphs (thin), and looking to add lean muscle. You will still want to follow the next steps. Nutrition is still key at this stage. If you started with a very high body fat percentage, then you have the advantage of easily integrating healthy foods into your lifestyle – as you developed the habit to do that throughout this process. The drawback? it can be quite easy to give up on eating healthy because you think that you “arrived”. If you are a naturally thin percent. Your main obstacle here is to actually change your eating habits (90% nutrition – going back to the top). A lot of thin people get away with eating unhealthy, so we think that by just eating that way and training, that’s enough. Sorry bud, but it doesn’t work that way. Supplementation can be beneficial at this stage as well. If you are engaging in intense workouts, than it would be good to supplement to boost recovery. I personally take this Collagen protein in the morning and some minerals and Vitamin C. I am not too crazy about supplementation. 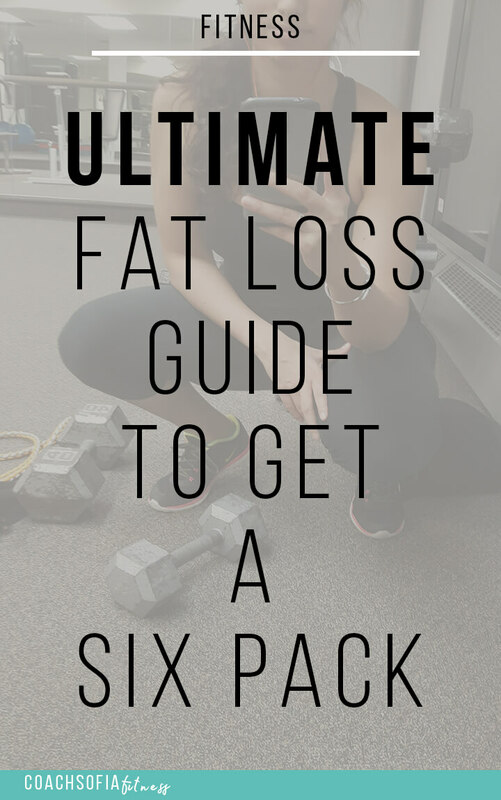 If you followed the guide, you probably developed a decent core strength and you want to start lifting more challenging weights which will help you easily lose belly fat and also add definition to your midsection. Keep in mind that it is important to train your abs the way they like to move. So instead of always doing plank exercises, you can start doing standing ab exercises, rotation, extension and flexion. I hope you now have a way to get started on your fat loss journey, or on your tone-up journey 🙂 this is based on my own experience and also working with people who have started from the top. All the people I know, who are committed, have patience, dedication, and faith in themselves, have achieved their end goal and feel amazing. Please leave me a comment below if this was helpful.